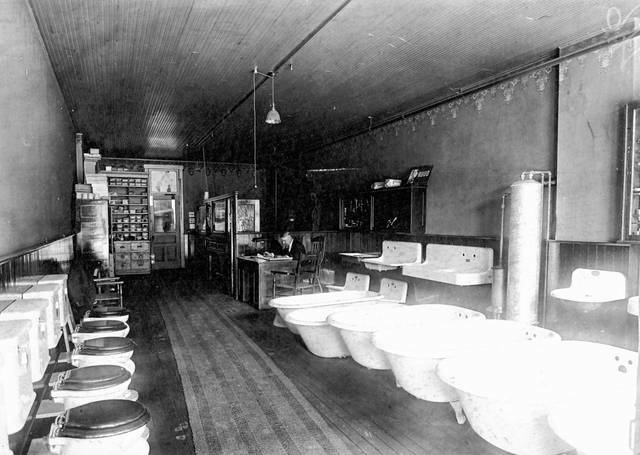 Toilets, bathtubs and sinks are lined up for customers at the company showroom, 125 E. Spring St. One of the owners is seated at the desk. The photo is undated. 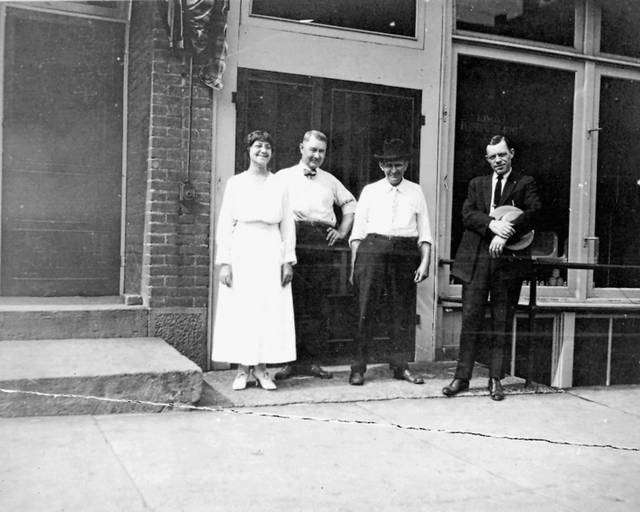 Lou King, bookkeeper, owners Charles C. Cowle and Charles M. Cantieny, and an unknown salesman pose for a photo, likely in front of the East Spring Street building. The photo is undated. 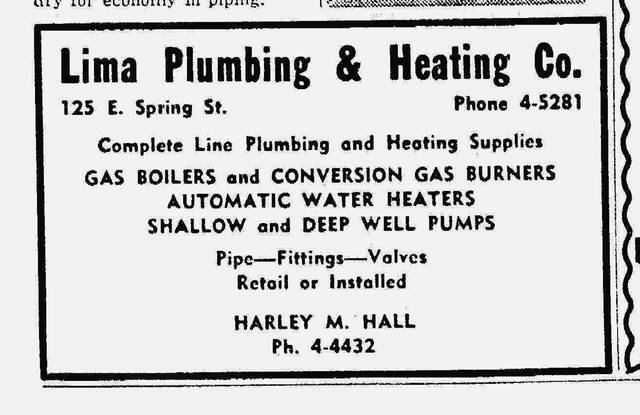 A newspaper ad from 1949 shows the company’s wares, from well pumps to water heaters. This ad from 1944 shows Walter Milnor and Harley Hall and their long years of service in the Lima industry. LIMA — Sitting atop a still-producing oil field with an expanding industrial base and a population that had more than tripled in the previous 25 years, Lima’s future, the Times-Democrat assured its readers in a story on Dec. 23, 1905, was looking very good. To back up its bragging, the Times-Democrat ticked off a list of businesses that was indeed impressive, and long. Among the many on the list were, the National Roofing Tile Co., the East Iron & Machine Co., the Lima Pork Packing Co., the Star Iron Works and the Economy Machine Co. The Eagle Stave Co. turned out staves and hoops for barrels and Model Mills produced Pride of Lima Flour. Lima residents in 1905 could enjoy a cigar rolled at the Deisel-Wemmer Co. and a beer from the Imperial Brewing Co. on a passenger train pulled by a steam engine from Lima Locomotive and Machine Co. There was even, according the newspaper, an increase in the “number of drink-dispensing establishments.” And for all plumbing and heating needs, which were growing as buildings from homes to hotels installed indoor plumbing and heat that didn’t involve piling logs in a fireplace, there was the Lima Plumbing & Heating Co.
“The Lima Plumbing & Heating Co. is the oldest and most completely equipped establishment of its kind in the city. This business was founded by Baxter & Co., who were succeeded by A.C. Reichelderfer. In February 1905, the present company assumed the ownership, having been incorporated under the Ohio laws, with a capital of $10,000, paid in,” the newspaper wrote. Judging by the absence of advertising from other firms in the 1880s, A.C. Baxter, Jr., & Co. was one of the few options available. Ads from 1885 described the firm as “the only first-class plumbing, gas and steam fitting establishment in the county.” The ad promised Baxter & Co. could fill needs for lead pipe, sheet lead, iron pipe and fittings, bath tubs, sinks, and a full line of goods for steam and water pipe fitting. The field got much more crowded in the 1890s as Lima boomed thanks to the 1885 discovery of oil. 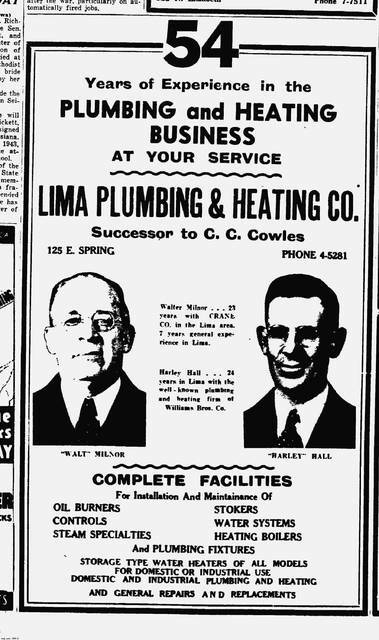 Cantieny, Cowles and Gonnella all were involved with other plumbing companies before coming together as the Lima Plumbing & Heating Co. The newly formed company eventually moved to expanded quarters at 125 E. Spring St., a building formerly occupied by O.F. Rasor Truck and Storage Co.
As Lima grew and new buildings went up, Lima Plumbing & Heating was often awarded contracts for their plumbing and heating needs. One of the first, awarded in September 1905, was for plumbing work on an addition to the county infirmary. The company won with a bid of $245. The first decade of the 20th century also was the decade of President Theodore Roosevelt, who gained much of his notoriety for breaking up the trusts, the corporate conglomerations he felt restrained trade. Trust busting zeal trickled down to the local level and, in 1906, even ensnared Lima Plumbing & Heating. Lima Plumbing & Heating got back to plumbing and heating. Among the projects the company worked on in the 1920s were the Cambridge and Argonne hotels, the City Loan building and the W.T. Grant store. Ownership of the business eventually passed on to Walter C. Milnor and Harley Hall, who would run the business jointly until Milnor, citing illness, withdrew from the partnership in April 1949. By 1953, the company was being operated by Hall and Kermit Graessle. Lima Plumbing & Heating remained a fixture at 125 E. Spring St. until it went out of business in July 1975.